This post was originally published on our blog The Treatment. 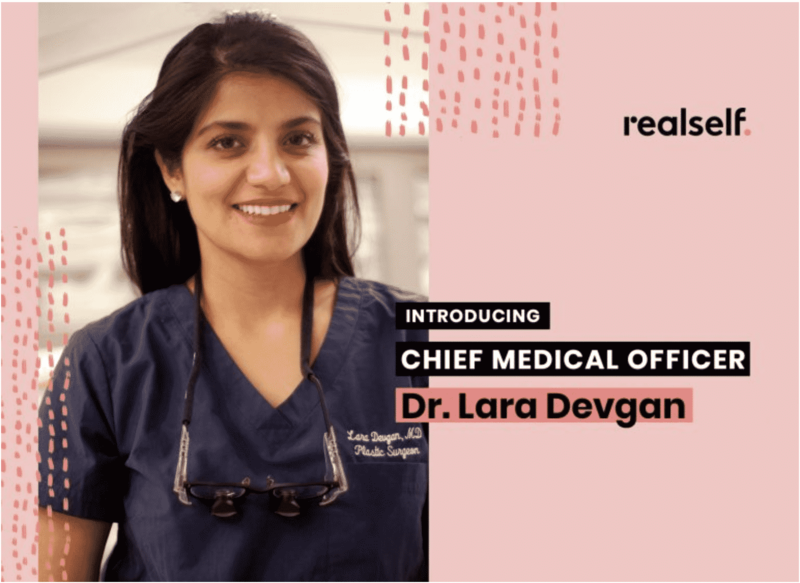 Today, RealSelf announced its first-ever Chief Medical Officer (CMDO), Dr. Lara Devgan. It’s exciting news for the millions of people who visit RealSelf each month for help in making smarter decisions about aesthetic treatments. Based in New York City, Dr. Devgan is a board-certified plastic and reconstructive surgeon. Her special interests include cosmetic surgery of the face and body, as well as reconstructive surgery for breast cancer, skin cancer and facial injuries. She also owns and operates a medspa, has a skincare line, teaches a quarterly injectables master class, and is an instructor at Manhattan Eye, Ear & Throat Infirmary. “Adding a Chief Medical Officer to the RealSelf team adds important perspective, expands our commitment to transparency and helps empower consumers to make smart, confident decisions about cosmetic treatments,” said Tom Seery, RealSelf CEO. We talked with Dr. Devgan about her new role, how the concept of beauty has evolved, and how she balances a thriving practice and growing family with self care. With everything you have going on in your personal and professional life, why did you decide to join RealSelf as our first Chief Medical Officer? One of the most important parts of what I do is education. RealSelf offers a modern, reliable source of information to millions of people, and I am thrilled to have the opportunity to be part of helping so many people. I really like that RealSelf provides a platform for not only informing the public about a subject that was once considered taboo, but also an easy and accessible way of providing a wealth of information to those interested in cosmetic treatments. I do have a busy practice and family life, but I’m extremely interested in innovation and helping people. And I think it’s incredibly innovative to marry the tremendous need for accurate, reliable, diverse information with a cadre of doctors, nurses and healthcare professionals who can provide answers and information. I really like that RealSelf is filling that space, and it’s really exciting to be part of that process. I became a plastic surgeon because I was drawn to its amazing combination of science and art. There is a huge aesthetic component in what we do. I like that beauty is rooted in the milimeters and fine details. I like that I can use my interest and aptitude in science and anatomy, but also think about things from a creative and aesthetic perspective. Being a plastic surgeon allows me to take care of people from all walks of life, all ages, and all backgrounds. I’ve had patients who are one day old and patients who are 90 years old. I’ve operated on every part of the body from the scalp, to the nose, to the breast, to the body, to the genitalia, all the way down to the toes. Much of reconstructive plastic surgery is collaborative with other doctors and surgeons. And on the flip side, much of cosmetic plastic surgery and nonsurgical treatments are about collaborating with patients. You have to be sensitive and really in tune with meeting other people’s needs, being medically responsible, responding empathetically, and always trying to do your very best. Since you started your practice, how have you seen the concept of beauty change? I think beauty has become a lot more democratic. In previous eras, beauty meant being a skinny supermodel on the cover of a magazine. Now the media and cultural perception of beauty is changing. You have leading ladies in movies in their 50s. You have fuller lips and wider hips that used to be completely verboten, and now they’re aesthetic ideals. Beauty takes many different forms. People are much more comfortable now with the idea that beauty means different things to different people. There is not one universal standard of beauty. In any given day, I’ll see one patient who wants the exact opposite of what another one wants. I think that’s part of a modern definition of beauty. How do you see changing beauty standards play out in your patients’ requests? Patients come in for a spectrum of treatments, from very minimally invasive and noninvasive treatments all the way up to major surgical interventions. For some people, optimizing their facial beauty might be something as simple as having a laser treatment to resurface fine lines or sun spots. For others, it might mean a major body contouring operation. I’ve also seen an increase in male patients and international patients who travel from all over the world. The space of beauty has expanded to accommodate a whole range of people now. What role has social media played in demystifying cosmetic treatments and eroding the stigma? Social media is uniquely suited to aesthetic medicine because it’s a very visual field, and social media is inherently visual. I think it’s so fascinating that all the tips and secrets that used to be hidden in the dark corners of your doctor’s office are now put forth into the world. Social media is very helpful in patient education and engaging with the doctor community at large. It’s also very helpful in showing people what’s going on behind the scenes of people we idolize and put on the covers of magazines. It’s a really powerful phenomenon. Interestingly, social often slammed for creating unrealistic beauty standards, and it does to some extent. So many people now are facetuning their selfies and filtering themselves and photoshopping, so there is that unrealistic beauty standard being perpetuated. But on the other hand, when legitimate doctors and surgeons show real procedures, being performed on real people, we’re demystifying what’s going on and showing a little bit more behind the scenes. So that can also be pretty powerful. On a practical level, social media is responsible for increasing engagement with cosmetic procedures. It has helped me improve patient awareness and education about topics that can be hard to talk about. It has helped me connect with my patients. And it has also helped me develop a patient base from every corner of the world. How would you describe your relationship with your patients? My patients are very important to me. I’m really committed to going the distance with every one of my patients. It can be very vulnerable to walk into a room with a stranger and tell them things you don’t like about yourself. I always try to be humble and put myself in my patient’s shoes. There is an inherent awkwardness in what I do, so I try to do everything I can to make it less awkward and make what could be a humiliating experience into a very empowering experience. I want people to feel even more beautiful than they already were, not ugly and needing to be changed. What excites you most about medical aesthetics now — and in the future? It’s a really exciting time in medical aesthetics. We have newer and better generations of lasers, injectable fillers, neuromodulators, implants, and minimally invasive treatments. That’s the most exciting part of the field right now. We’re in an era where people are deferring surgery in favor of less invasive treatments. Not only has this destigmatized an extremely commonplace occurrence, it’s also elevated industry standards. People always talk about demystifying, and there’s almost a negative connotation, like we demystified lip fillers, therefore we’re normalizing it, which is not at all what I’m saying. What demystifying cosmetic procedures really does is elevate the playing field for people like me who are performing those procedures. On the provider side of things, we now have much more information and sharing. We have more education, and we’re continuing to elevate our work, and the patients are the beneficiaries of that. Even in the surgical world, for invasive procedures, we are pushing the envelope and trying to make incisions smaller and scars heal better. We’re trying to really eliminate obvious signs of surgery, while still helping people achieve safe and optimal aesthetic results. It’s really cool for people in my generation. We’re aging in a very exciting era. You’re a mother of six, including a new baby. How do you balance the demands of your job with being a mom? How do you make time for self-care? [Laughter] I try to squeeze it in any chance I get, I really do. I try to focus on a few very simple things that I know are going to make me feel a little bit better for the rest of the day. In the morning, I’ll listen to my favorite podcasts while I’m taking a shower, to build in a little mental reprieve. When I spend time with my kids, I try to talk to them about stuff that they’re interested in, and really focus on that moment. I try to enjoy little things as they happen, which sounds very silly, but if I’m eating something delicious I try to really enjoy that bite of food. And when I’m sleeping, I wear really comfortable pajamas and sleep on a really great pillow case. I try to immerse myself in every experience. Have you ever seen those dogs that stick their heads outside the car window? And they look just so happy, because the wind is blowing through their faces and their fur. I once read a funny anecdote about how that’s the trick to taking a 30-second vacation: you just have to be that dog, and that’s as good as a week in Rome. You’re loving the moment. So my version of self-care is taking the time to enjoy the nice things in my day, whether that means a spritz of perfume, a swipe of red lipstick, a bite of a delicious meal, a hug with my kids, or a chat with my husband. I just enjoy it.